Nick is another carp angling phenomena. His carp fishing life is unlike anyone I have ever known and although I have known Nick for almost thirty years I have very rarely fished with him!.... why? , because he doesn't fish my sort of carp water. The concept of sitting on a lake fishing for a Bazil or a Heather is totally alien to Nick..." why would I want to devote all that effort to catch a fish that everyone else has caught" would be his reply to that type of question. Nick's true passion is for the unknown in fact ' Passion for The Unknown ' would make a great title for this book, if it needed a name. His passion is just as strong if he is here in the UK fishing for a 'possibility' on a little known pit or stretch of the canal as it is on an unknown stretch of a European river of high up in the Alps chasing dreams. 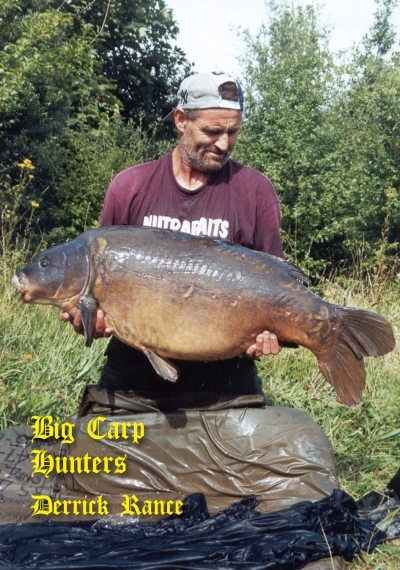 Nick is a professional carp angler, in fact he had a monthly column in Big Carp entitled just that. As a sponsored angler Nick has certain demands placed upon him. Demands to be seen regularly in the angling press and to be out there catching and doing it rain or shine, winter and summer. So Nick's time is divided into two very different types of angling - Feature fishing and Real fishing. As a feature angler Nick is the feature editors dream. Book him up in the dead of winter to catch a fish for the camera and he won't let you down, snow on the ground, lake half frozen, Nick's slither of ' Rami ' will get one out on the worst of days. Nick's features are world class, he's been on dozens of front covers here and abroad, he delivers the goods and hits the deadlines with practised ease these days and not a month goes by without Nick's writings somewhere. This also makes him a very sought after consultant for bait and tackle firms and it would be fair to say that Nick has done the rounds, having worked for the best Shimano, Dynamite, Solar, Aqua, Sonik, Korda to name drop a few. Nick's feature fishing is second to none, he is the ultimate brand figure head because no one catches them like Nick.....he is a great angler! However its Nick's ' Real' fishing that is his passion, articles written and emailed off, Nick is planning his 'Proper Season' which consists of a Spring UK target or two and a whole list of forigne venues, venues which most of us have never even heard of and even the top European anglers haven't, except in whispers. Nick is a pioneer, he likes to be early on waters, whether its here or abroad and its this part of Nick's fishing life that you haven't read about before, this is the bit Nick hasn't written about before until now...... so sit back and prepare to be enthralled by one of the countries best and most talented anglers. Believe it or not Nick is a shy and quiet angler, just because he does a lot of features does not mean he shouts or brags about his catches, its his work. The opposite in fact. You have never seen Nick do a slide show! Nick shuns the lime light, hates the publicity, shrinks from the stage where other far lesser anglers strut their stuff like egotistical morons. yet somehow because of this feature writing ( his job) people have the wrong idea about Nick, and have him confused with some other ' glory hunters' of our beloved sport. Nick began his carp fishing where he grew up in the Colne Valley, cycling to Savay as a kid and earning the reputation as ' the pest' on those secret waters the Cons and Fisheries. When taken under the wing of some boys a little older than him James, Kerry and Lee he was quick to learn and outfish his peers. As a fourteen year old kid he wrote about his adventures on the cons for Big Carp and that's when Nick had his first encounter with the ' haters', jealous of a little boy's catches they threw him out the club and smashed his world to pieces. Nick grew into a man overnight. Over the next decade accompanied by his close friend Dan the pair fished fast and hard on the pits, canals and rivers in that region .Nick pioneered much of the canal and their catches remain legendary. Nick did not write any more articles until it became his profession years later, a lesson had been learnt but not before he also taught those haters a lesson in return as you will read. The last decade of Nick's ' Real' fishing is incredible, I was in awe as we covered venue after venue, target after target his determination is unequalled, the effort involved and miles driven unimaginable but the sights he has seen, the dawns on distant shores out weigh it all....never has the phrase ' effort equals reward ' been more applicable. Nick has never written a book, he should have written ten by now! but was too busy fishing. So at last, here for the first time is Nick's carp fishing life history....truly a Big Carp Hunter!